Roso is an impressive male! He has a commanding presence, and legs like tree trunks with coverage all the way to the toes. Conformationally, he is flawless. Rarely do you see alpacas who have the balance and fluidity that Roso does. Here is your chance to get these incredible grey genetics. Roso is the future of grey. A big, bold male from the Crescent Moon Ranch breeding program that combines Patagonia grey genetics from granddad, Danko, with the fine-fleeced Crescent Moon Ranch mom, Poppy. This great pairing produced Roso's dad, Rayo del Sol. 1/2 interest in Rayo sold for $175,000! Roso's mom is an Accoyo Legacy daughter. 1/2 interest in Legacy sold for $750,000! 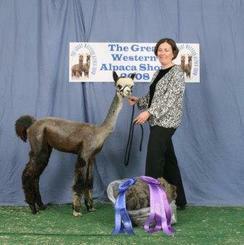 Roso's 1st cria (a female) has accumulated 4 Color Championships. His crias are winning and winning well in the show ring. Nearly all of his kids are rose or silver grey, maroon, or black and all carry his density, wonderful fleece character and presence. You will want one of these. Naturally, he has perfect conformation and presence, but his remarkable fleece takes him to the head of the class. Dad, silver grey Rayo del Sol has multiple halter championships including Color Champion at the 2003 All American Futurity and 2002 and 2003 AOBA National Show. 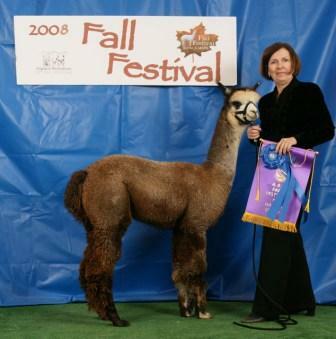 Mom won blue for her fleece in a class of 13 at the 2004 Midwinter show (her only time shown). Roso is the perfect synthesis of his parents' best qualities. News! ORLANDO HAS JUST BEEN NAMED HERDSIRE OF THE YEAR 2013, FOR THE SECOND YEAR IN A ROW! This award is based on the number of points accrued by winning offspring at MAPACA, to date the largest show in 2013. 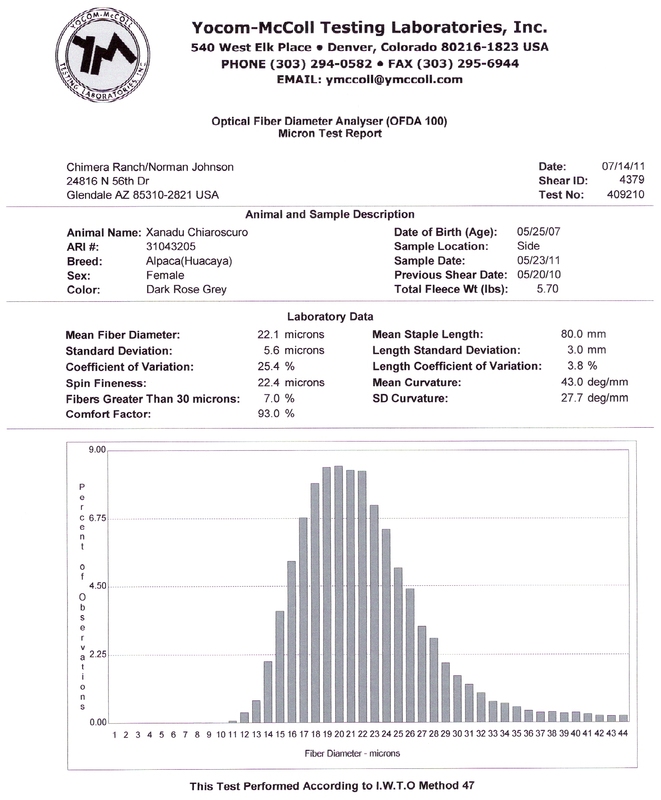 Orlando is in Colorado at Alpaca Annuals, and reduced price breedings are available. Please contact Susan Mikulecky for more information. mikcentral@msn.com. 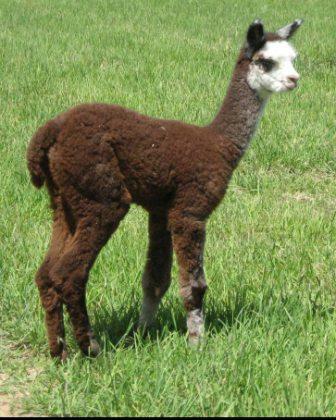 Update: Empire Alpaca Extravaganza 2012, Gray and Fawn Halter Champion, and Gray Fleece Champion sired by Orlando. Also 6 Blue Ribbon winners sired by him too. Here is the new standard for grey! Orlando stands above the rest with his consistent, dense architecture from his tail to his topknot. The judges have raved about this male from the time he hit the show circuit, and his offspring are now following in his footsteps with multiple Championships and Reserve Championships. When bred to grey or black his cria's colors have been 100% grey or true black with the exception of one which was bay black. He has also shown the ability to throw grey out of fawn as we have seen three cria like this from this color pairing. After two years of breeding on the west coast, he is now ready to add to east coast genetics. Orlando's stud fee is $5,000, with generous discounts for drive by breedings. For details please contact Nancy at nlake@grayalpacacompany.com or Jeff at jhull@grayalpacacompany.com. Full disclosure always. Orlando offspring were first shown in 2008, and to date they have won over 80 Color Championships/ Reserve Championships, and over 150 Blue Ribbons! Chiara's sire is 5 time color champion rose grey, Rayo's Roso e Grigio, a son of Rayo del Sol and an Accoyo Legacy mom. 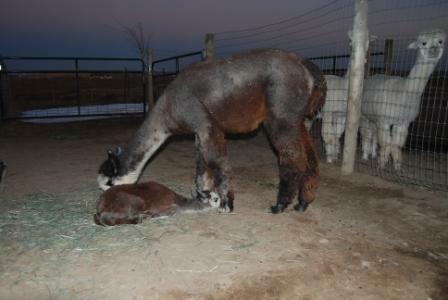 Her mom Daisy May is a maroon foundation mom from Xanadu Farm Alpacas who has several grey show ring stars. This championship background was a foundation for Chiara to also be awarded two color championships herself. What a thrill it was for us to find Chiara. We desired a beautiful rose grey female with fineness, density and structure as part of our foundation and she was a perfect match. 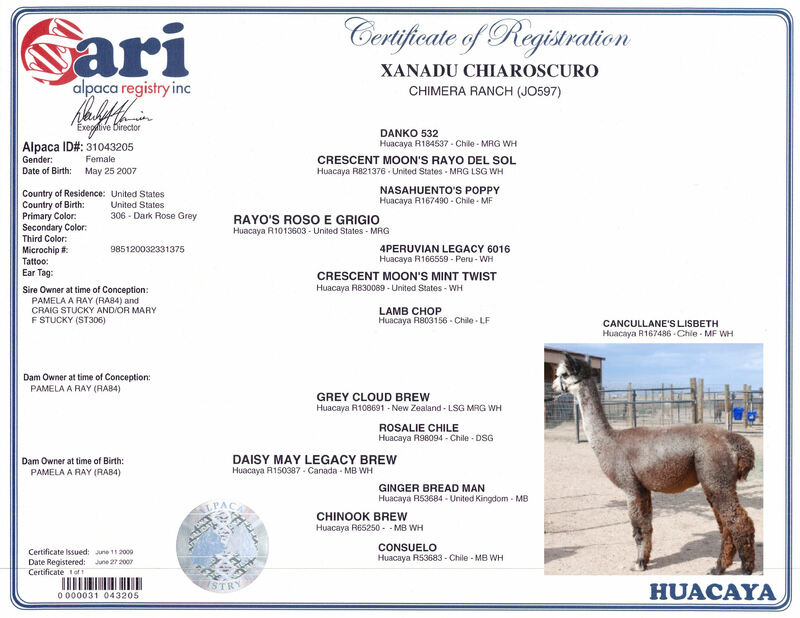 Xanadu Chiaroscuro was bred to MFI Toledo and provided us with a beautiful rose grey male in November 2009. Our prayers for a spitting image of Chiara in her beautiful grey package were answered. 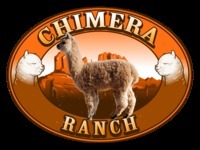 We are anxiously a waiting the day when Chimera’s Orion Grey will be old enough to make his way into the show ring.